Costa Rica is a wonderful country and Atenas is supposed to be the town with the best climate in the world. But how can it be that finding a delicious ice cream is so difficult with such perfect conditions? When we came to Costa Rica in September 2011 we decided to change this. Our idea was to produce one of the best ice creams in Costa Rica and in March 2012 we started the adventure with the arrival of our new professional ice cream machine. Now it’s up to you to decide if we will succeed or not. Before we left Germany I visited the first school in Germany dedicated to teach how to make the mouth-watering ice cream based on few natural ingredients. Unlike most Italian Gelaterias we don’t use pre-mixed powders for each flavor but instead I learned the (I have to admit not so many) secrets of making any ice cream or sorbets using fresh, natural ingredients without the use of artificial flavoring agents or colorants. Needless to mention that we also don’t use preservatives. I always liked making ice cream and enjoyed being creative when trying to invent new flavors or, to be honest, to copy flavors of my favorite ice cream which is Häagen Dasz. The advantage of heaving learned how to make ice cream from scratch is that you know the critical parameters and how they can be adjusted. This way almost any flavor is possible to create subject to the condition that the natural flavor is available. Be curious! AT: Alex, when we met you almost two years ago, you were very excited about your new adventure. Your exact words were: “I am going to make the best ice cream in Costa Rica! Do you remember that? AH: Well, if you come to a new country and depend on earning enough money to live here you need a clear and realistic goal. To be honest, Costa Rica is a beautiful country that offers lots of great things, but good ice cream (for an affordable price) is not on the list. I knew that the quality of my ice cream was pretty good for an amateur and thus I decided to become a pro. I visited the first school in Germany dedicated to teaching the making of artisan ice cream from scratch from natural ingredients without the use of artificial flavors or colorants. This knowledge combined with creativity and the wonderful fruits you get here led to mouth-watering ice cream and I think I’m on a good way to reach my goal. AT: Tell us a little bit about how you became interested in this product? AH: I think it’s not hard to get interested in ice cream. Almost everybody likes ice cream and it’s a delicious product. When we had been on vacation in Costa Rica some years ago we lay on the beach at Playa Hermosa, sun was burning and I was craving for refreshment. No café was open and I thought one could make a fortune selling ice cream at the beaches using a mobile ice cream truck. On t hat day the idea was born to come to Costa Rica and sell ice cream. Well, for cost reasons I decided against the mobile ice cream truck but the basic idea lived on. AT: In our research, we read that you are a biologist. It seems that making ice cream is a bit of a career change. How did that happen? AH: Yes, it’s kind of funny. I studied biology for many years and ended up making ice cream. But hey, it makes me happy and enables us this wonderful life in Costa Rica. I worked 17 years in a biotechnology company and every few years I tried to do something new. For me career never was important but I wanted to have enough time to spend the money I earned. At some point we decided we want to have more ‘Pura Vida’ in our lives and we didn’t want to wait until we are 65 because you never know what happens the next day. AT: What made you decide that Costa Rica, and specifically Atenas, was the place that you wanted to move your family to? AH: As Antje and I used to dive we saw a lot of beautiful places in the world. But when we first came to Costa Rica we knew this is the place we wanted to live in, well, if not forever, at least for the next years. In the meantime I can imagine living here forever. The arguments for Costa Rica were that it is culturally not as different to Europe as it is the case for many beautiful Asian countries. Spanish is a language that is quite easy to learn and it is a place where you could live cheaper than in Germany, but not as cheaply as we initially thought. And last but not least, the people in Costa Rica. During our vacation we already found them very friendly and helpful and even after two years living in Atenas I’m overwhelmed by the warmth and helpfulness they show. Initially we wanted to move to a place near the beach but when ‘suddenly’ our son Nick appeared in our lives we had a new responsibility and we decided to go to Atenas, which offers better medical and educational opportunities. AT: Last year, you participated in CATUCA’s Climate Fair with great success. This year, we were told that the ICT (Costa Rica Tourist Board) recognized your product as a positive and innovative addition to the offer- ings of the Climate Fair. How does this kind of endorsement affect you personally? AH: The Climate Fair was a great chance for me to present my ice cream to a broader public and it was the perfect point to start my business. I want to use this interview to thank you and many other people here in Atenas for the very kind support you and they offered me. It’s so helpful when you are new in a country and want to start a new business.The following year things developed pretty well but we were still far away from earning enough money to afford living in Costa Rica forever. Thus the award of the ICT was an acknowledgement that I’m on the right way and that I just have to keep going in that direction. A few weeks later, a guy called me on the phone and told me that a friend of his tasted my oatmeal-honey ice cream and that he was delighted. He said that he and his partner wanted to open an ice cream store chain in Costa Rica and maybe I’m interested in providing them with the ice cream. I think you can imagine my face… Well, we met for a tasting and before we met I was so sure that this will work out and be that thing that will keep us in Costa Rica. Needless to say they liked my ice cream and within the next month the first ice cream store will be opened in San Jose close to the ‘Teatro Nacional’. AT: That is great news, congratulations! Can you explain in simple English the steps you take to guarantee that your product meets health requirements and also tastes good? AH: Cleanliness is a crucial point when producing food. When I went to the ice cream school in Germany I learned all the necessary steps to work in a clean ambience and how to produce a reproducible quality. Of course I also had to do the ‘Manipulación de Alimentos’ course here in Costa Rica. I just opened a new ice cream lab, which offers perfect conditions for making good ice cream in a spacious and tidy atmosphere. However,the key to a good taste is good raw materials; especially when using fruits as the quality, sweetness and taste vary from month to month. Thus, when the quality and the prices are good, we buy and process large quantities of fruits and freeze them until we need them. Finding all the necessary raw materials in a good quality was the hardest part when I started my business. You need three different kinds of sugar and some other things when you make ice cream. In the meantime I found sources for them here in Costa Rica but some things I still buy in Germany. Believe it or not, cacao beans come from Costa Rica but it is not possible to find a good quality cacao powder here in Costa Rica. I tried different brands but with all of them the ice cream tastes ‘sandy’. So I have to order it from Germany. AT: How do you go about selecting the flavors you will make? AH: First of all I make flavors I like. Thus I don’t offer Papaya ice cream! Second I try to use the fruits I get here like passion fruit, mango, guanabana and cas. However, it is important that they can easily be processed and are available for a reasonable price. All the processing of fruits is done by my wife Antje and me and we don’t use commercially available pulps because they often have sugar or preserving agents added. AT: How has the community received your product? AH: The community gave me fantastic feedback and it’s just great when you walk through Atenas and many people know you as the ice cream guy. AT: Where can people sample or purchase your delicious ice cream? AH: There are several places in Atenas where people can buy our ice cream like Balcon del Café, the Mexican Restaurant ‘Mi Casa Es Su Casa’ or Finca Huetares. But if you would like to have the full choice or samples you can visit us at home in Barrio Fátima. Exact directions to our house and a list with the other locations in and outside Atenas can be found on our website (www.LaCosaRica.com). AT: Tell us about your expansion and the new headquarters. AH: I already mentioned the new lab. Within the next few days a new professional ice cream machine and a pasteurizer will arrive and this will enable me to produce much higher quantities. And I’m pretty sure that with that equipment the quality of the ice cream will again increase. I can’t wait to taste it. AT: Is there anything else you would like our readers to know? AH: People always ask me what kind of ice cream I make. Well, it’s not so easy to answer. Generally people differentiate between gelato and American ice cream. American ice cream has much more fat than gelato (14% or more), often egg yolk is added for a rich taste and it has much more air included into the ice cream. I also use egg yolk but my milk- based ice cream only has around 7% fat and I only add a little air into the ice cream. Thus it is a mixture of both types and I call my product artisan ice cream using the general meaning of the word ice cream. AT: Thank you very much for your time, Alex, we will follow your progress and wish you much success! AT: Thank you for the chance to give this interview! 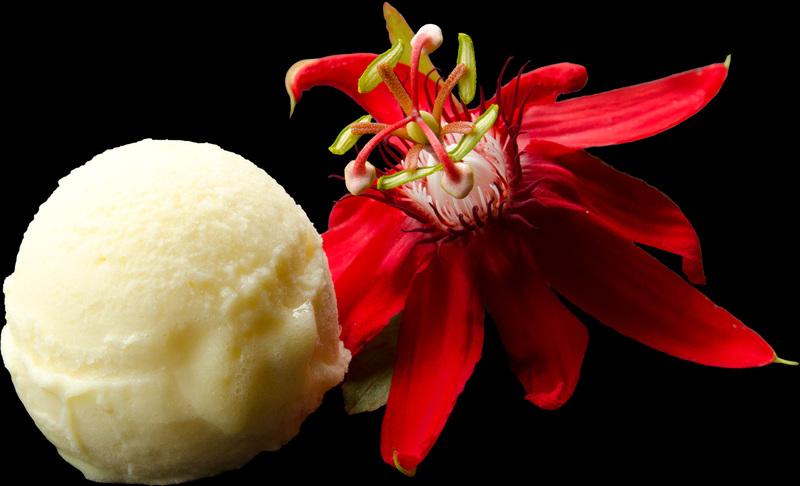 La Cosa Rica sells artisan ice cream in 140ml (1000 Colones) and 900ml (3500 Colones) containers. For bigger events, larger sizes starting from 3,5 liters are also available. You can contact them at Info@LaCosaRica.com or 8532-4814.